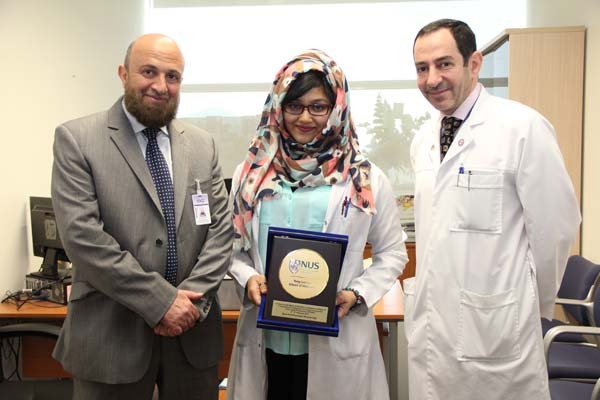 Second year medical student, Sowshan Mostafa won the 2nd Best Oral Presenter Award at the 12th Asia Pacific Medical Education Conference and 3rd International Conference on Faculty Development in the Health Professions at the National University of Singapore after competing against more than a 100 research presentations by renowned international Medical educators, physician-in-training consultants, fellows and residents. The newly founded and rapidly growing Medical Education Research Group (MERG) at Alfaisal University, supervised by Dr. Akef Obeidat, sent a group of 20 students along with 2 faculty members to attend the conference. The students are young researchers who presented an impressive total of 6 posters and delivered 2 oral presentations. The Award is a great achievement for MERG and Alfaisal University, and we hope for many more to come! 5 – Group Picture: Taken at Alfaisal Campus with Dean, Dr. Khaled Al Kattan, and some of the authors of the presented paper – Syeda Mina (3rd year), Sowshan Mostafa (2nd year), Haneen AlBarqawi (2nd year), Asma AlNajjar (4th year) Dr. Akef Obeidat and Dr. Ahmed Abu-Zaid.